The Tennengebirge Massif is a mountain range that belongs to the Northern Calciferous Alps. It is a very characteristic piece of landscape with lots of cliffs and open rock, famous for its karst formations and caves. 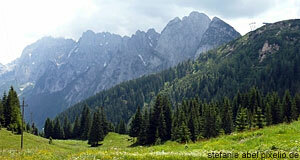 In fact, the Tennengebirge is one of the "cave richest" mountain ranges in the World. Almost all of the Tennengebirge is formed by a 60 square kilometre large plateau reaching to the town of Bischofshofen. About 37 square kilometres of the Tennengebirge, which is also one of Salzburg′s official travel destinations, are situated in altitudes above 2000 metres. In 1982, the Tennengebirge became a nature reserve; since then, rather strict regulations regarding environmental standards apply. The Tennengebirge is segregated from the mostly Bavarian Hagengebirge through the Pass Lueg, once battle ground in the Napoleonic Wars. The Tennengebirge can be accessed via a range of communities, all of which try to promote hiking tourism and various Alpine sports: Werfen, Pfarrwerfen, Golling and Werfenweng are the most important municipalities of the Tennengebirge. However, there are also the communities of the Lammertal, circling around the mountain range. Note Sankt Martin am Tennengebirge, Annaberg-Lungötz, Abtenau and Scheffau am Tennengebirge. The highest summit of the mountain range is the Raucheck with 2430 metres. The southern summits of the massif are generally higher than their northern counterparts. The Tennengebirge and the local communities have several tourist attractions to offer, some of which are of international significance. The most important is probably the Festung Hohenwerfen, a 16th century fortress; and the nearby Eisriesenwelt in Werfen, a 42 kilometre long ice cave of which parts are open to the general public. Many of the regional caves are not fully explored yet; there is a caving society in Salzburg that maps many kilometres of new "cave land" every year. For those who prefer to hike above ground and enjoy both landscape and daylight, there is a dense network of hiking paths in the Tennengebirge. To point out only two, note the Arnoweg and the Via Alpina. The latter one is a national pathway with one section passing through the Tennengebirge, specifically between Lungötz and Werfen. Note that a lack of water is ironically met be frequent fogs in the Tennegebirge, which creates a certain degree of danger especially for inexperienced mountaineers. During the winter, ski tours are popular. Note that there are many mountain cabins and huts in the Tennengebirge. The degree to which they are developed ranges from emergency shelter to borderline-hotel. Note particularly the following mountain cabins for possible hiking routes (altitude in brackets): Anton-Proksch-Haus (1590 metres), Dr.-Friedrich-Oedl-Haus (1575 metres), Dr.-Heinrich-Hackel-Hütte (1530 metres), Edelweißerhütte (2350 metres), Elmaualm (1520 metres), Freilassinger Hütte (1550 metres), Gsengalmhütte (1450 metres), Gwechenberghütte (1365 metres), Laufener Hütte (1725 metres), Leopold-Happisch-Haus (1925 metres), Mahdegg-Alm (1200 metres), Rossberghütte (1000 metres), Stefan-Schatzl-Hütte (1340 metres) and the Werfener Hütte (1970 metres).